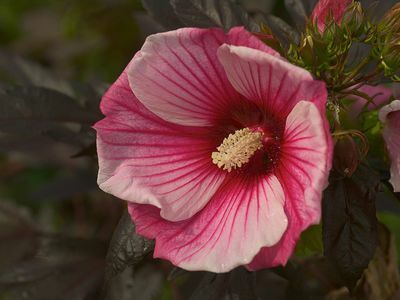 Hardy hibiscus moscheutos 'Small Wonder'. Large flowers with shades of pink in a pin wheel pattern. Pink veining and streaking are evident before the buds even open! This new beauty features the darkest purple leaves of any perennial hibiscus to date. Long blooming period. Tolerates dryer conditions. A newer introduction from the folks at Flemming's Flower Fields. PP#24072.